Location: Urbanspace Gallery, First floor, 401 Richmond St W.
Talk by Karin Eaton: ‘Reflections: Three Decades of Murals’ from 6:30-7:30pm. Click HERE for more event information and to register for the event. The Toronto Mural Archive Exhibit reflects on the history of mural art in the city. The Toronto Mural Archive is a research project and touring informational exhibit, the first of its kind to survey the history of mural art in Toronto. Mural Routes has gathered articles, information and stories, taking time to reflect on the field of public mural art’s developments so far. We have combined our research together to share ‘the story’ of murals in Toronto in a touring exhibit. The archive provides context to both critically reflect and inspire the future mural art movement in Toronto, and to provide a template for other Ontario cities to follow. June 5th – August 11th: Urbanspace Gallery at 401 Richmond St. W.
With a focus on “bottom-up”, grass roots approaches, a wide range of local and global issues are examined including community, public space, housing, transportation, planning, governance, diversity, sustainability, and citizenship. 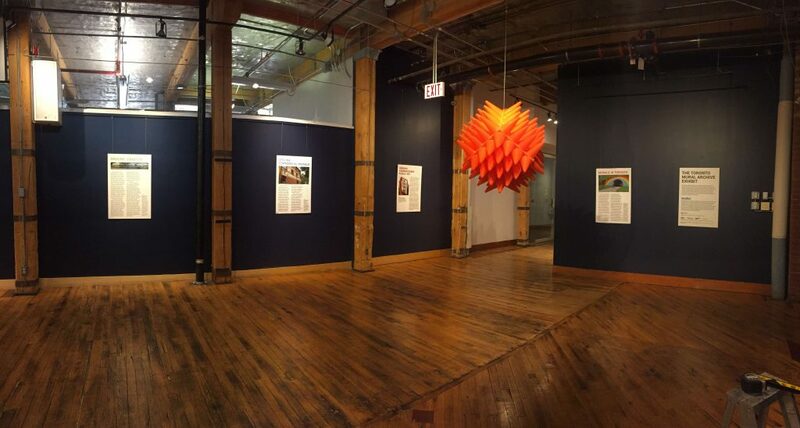 In partnership with many individuals and organizations, Urbanspace Gallery contributes to an ongoing discussion about cities, and offers visitors a space to learn and reflect on their place within them. More information about Urbanspace Gallery can be found here. Questions? Comments? Contact: Tara Dorey, Curator, The Toronto Mural Archive at programs@muralroutes.ca.